Sleep is essential for your overall wellbeing to ensure you're well rested for your day ahead. There's often a common question of what the best mattress on the market is but, in truth, it will be determined by your personal preferences and needs. We've created a guide to review the best mattresses for a range of different people and needs so you can find the right solution for you. Hybrid mattresses combine two or more materials into a single mattress and are growing in popularity. This means that you can experience the benefits of multiple materials which provides a greater sleeping experience. The Hybrid movement is being led mostly by the online mattress retailers because hybrid mattresses are usually more effective at being suitable for all types of sleepers regardless of the position that you sleep in. The most common materials used in a hybrid mattress are pocket springs, memory foam and Latex. 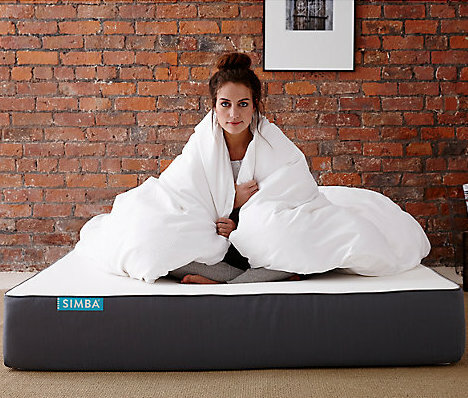 Our number one pick as the best overall value and hybrid mattress is the Simba sleep Hybrid mattress. This mattress has taken the industry to the next level and contains five different layers which all work in synergy to provide a high quality sleep. Being a hybrid mattress this allows you to benefit from the inclusion of multiple materials, including 2,500 unique conical pocket springs that each work independently to adjust to the shape and position of your body to ensure you remain supported. Also, there is a Visco memory foam layer that contours and provides a hugging effect to soothe your joints. The mattress is also hypoallergenic which makes it highly suitable for allergy sufferers while also promoting airflow through the mattress surface. What makes this such great value is that it's suited to all kinds of sleeping positions including front, back and side. The mattress also has an in-built flexible zoned base which means that movement is isolated when you move in the bed which decreases the likelihood of your partner being disturbed. For additional peace of mind, the mattress also comes with a 100-night trial and a ten year guarantee. Check out the full review here. Memory foam is one of the most popular mattress fillings, so naturally, the best mattresses on our list will have memory foam as one of its core materials. Memory foams main characteristics are that it contours to the shape of your body to provide support all along your body. This works to relieve pressure which can reduce pain that you’re suffering from and it's extremely comfortable so you’ll wake up in the morning feeling refreshed. Memory foam used to have a reputation of being hot to sleep on, but technological advancements have led to the memory foam mattresses having either an open cell structure to promote airflow or cool gel layers to disperse heat. Coming in as our number 1 pick for memory foam mattresses is the Eve sleep original mattress which is a superb upgrade from your current memory foam mattress. 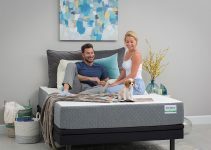 The mattress features a supportive layer of open cell Visco memory foam which not only provides support and pressure relief but also because of its open cell structure that promotes air flow and stops the memory foam from sleeping hot. Two other essential layers then sandwich this memory foam layer. On top is the Evecomfort layer that also uses open cell technology and gives the mattress bounce and responsiveness, so you don’t’ sink uncomfortably into the mattress. This layer is also breathable to disperse heat away from your body. Beneath the memory foam is a durable base layer that adds support to the structure and also contains a zoned structure which provides pressure relief to the vulnerable areas of your body such as your neck, back and hips. The mattress is suitable for all sleeping positions and comes with a 100-night sleep trial and a ten year guarantee. Read the full review here. Innerspring mattresses have been around for years, but they have undergone advancements to now use pocket springs. These springs are individually pocketed which means that they can move independently and these mattresses can contain thousands of these springs. The main benefit of pocket springs is that they adjust to the shape and position of your body to ensure that your body weight is distributed evenly over the surface making it great for supporting pressure points. The mattress industry has come a long way from having a layer of coil springs, and now there are advanced pocket sprung mattresses that provide so much more support and comfort giving you a better nights sleep. Not only this, but now you no longer have to settle for just one material layer in your mattress which is why we’ve chosen the Emma mattress as one of the more effective pocket-sprung mattresses because it not only has an effective pocket sprung layer, but also memory foam so you can experience the benefits of both. The Emma mattress features up to 2000 individual conical pocket springs that work independently to provide unique and sustained support to your body for the full night. 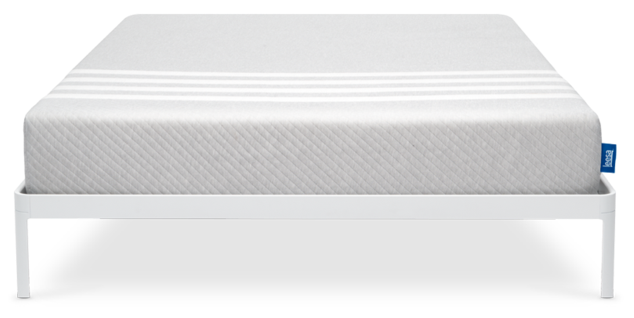 This allows for tension to be relieved from your body and the Visco elastic memory foam adapts to the contours of your body for additional support regardless of the position that you sleep in. The open pore material that’s used in the mattress also ensures that you remain cool for the night without overheating and sweating uncontrollably. As you’d expect with mattress-in-a-box manufacturers, the mattress comes with a 100-night sleep trial and a ten year guarantee. Get the full in depth review here. Traditionally it was often difficult to get a mattress that kept you cool, and different materials have different cooling capabilities. Now the majority of the best mattresses on the market have cooling qualities. Pocket spring mattresses have spaces in between the springs to promote airflow while latex natural disperses heat. Also, memory foam usually sleeps hot but the more effective memory foam mattresses now use open cell technology or cooling gel to keep you cool, so you’ll no longer have your sleep disturbed due to overheating. A mattress that can cool itself will also keep the mattress fresher and smell pleasant for longer. Overheating while you sleep can cause havoc to your sleeping pattern, heavily reducing the amount of REM sleep you get each night leaving you feeling groggy and unrested in the morning. The mattress has been constructed to provide you with a cool sleeping environment, so you remain cool and fresh for the full night. Despite the mattress containing memory foam, this is infused with a unique cooling gel formulation which keeps your body temperature down. Also, there is an air flow system inbuilt that removes excess heat from all areas of the mattress while also allowing fresh air to enter the mattress through perforations in the side of the structure. As this is a hybrid mattress, there is also a pocket spring layer which contains up to 2000 Encapsulated Pocket Springs, and this also promotes airflow because air can flow more free in pocket spring layers where the springs are individually pocketed. The result of this mattress is that the memory foam and pocket spring layers are very supportive, but your temperature is regulated efficiently due to the cooling technology. Discover the full review. As humans, we’re all different and have different needs so sharing a mattress with a partner who has alternative preferences can make this even more problematic. Customised mattresses can fix this issue as they can allow you to choose a custom firmness to suit your sleeping style. These layers are usually easy to adjust which means you can test each layer type until you find the one that is most suitable for you. Now there is no need to sleep on a mattress that doesn’t suit you just for the sake of your partner. 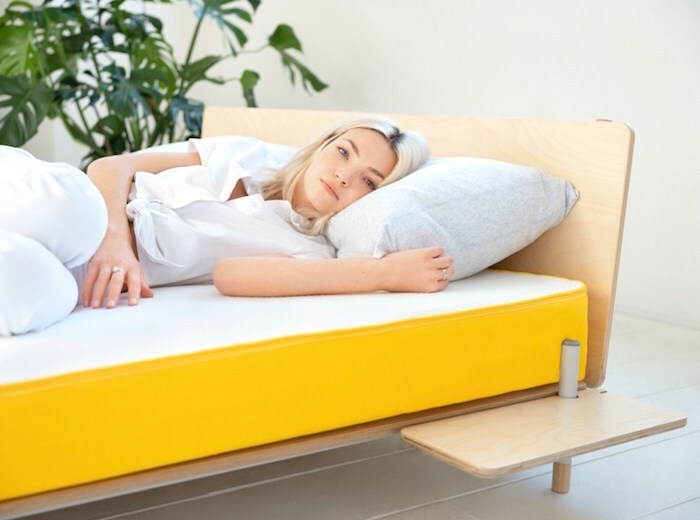 Sleeping Duck has created an exciting alternative to the usual mattresses that you get on the market that appeals to those who share a bed with another person. The mattress comes in two different firmness options of medium and firm, you can then adjust and interchange firmness for each half of the mattress. For example, if you prefer a softer surface, then you can have medium firmness whereas if your partner prefers a harder surface, then they can choose a firm surface for their half of the mattress. This stops either of you from having to compromise by sleeping on a surface that isn’t right for you. The mattress itself is a hybrid and uses many different material types to give you a restful sleep. The first is natural latex which is supportive but also promotes air flow. Beneath this is memory foam and a 5 zone pocket spring layer which gives you contouring and support which is even more critical if you’re sharing a bed with another person which is most likely the case if you’re interested in a customisable mattress. Dive into the full review here. Everyone will have a different budget that they have to spend on a mattress, and there are still some high-quality mattresses that you can get for a lower spend. Budget doesn’t mean poor quality especially with the influx of mattress-in-a-box manufacturers which allow you to get a highly effective mattress. Budget mattresses no longer mean low-quality innerspring mattress with no support or comfort. We’ve created a guide full of lower cost alternatives that will still give you the high quality sleep that you deserve. If your budget is a little more restrictive, but you still want a great mattress, then all is not lost, because the Eve Sleep Light mattress is a simplified version of their flagship mattress but always delivers a premium sleep. The mattress uses soft but responsive foam which means it still has bounce but is higher density to give a slight hug effect without having the horrible sinking effect. Beneath this is a high-density base layer that uses lower density foam to compliment the top layer. This high-density base layer has five layers within the foam which provide pressure relief from the most needed areas such as your back and hips. Included with the mattress are a 100-night sleep trial and a 10-year guarantee. The mattress has a medium firm feel which makes it suitable for all sleeping positions as you’ll be adequately supported whether you’re a front, back or side sleeper. This mattress is proof that you don’t always need many different layers to get a comfortable nights sleep, but if you have the necessary basic ingredients, then it can still be a high-quality mattress. Similar to hybrid mattresses, Latex is a material that's growing in popularity due to having the same contouring ability as memory foam but also has cooling qualities, so it disperses heat away from your body, so you don’t overheat throughout the night. Latex comes in two forms being natural and synthetic with natural being the eco-friendly option, whereas synthetic is a less environmentally friendly choice. Latex can be one of the more expensive options especially if you opt for natural latex, but if the price tag puts you off, you can always opt for a hybrid mattress that contains a layer of Latex as this will often be cheaper. Natural latex has numerous qualities which makes it one of the leading sleep surfaces available on the current market. This material is both responsive and comfortable which gives it a contouring effect that you feel when you sleep. The latex layer is 18cm thick and 100% pure while also having a medium firmness which makes it ideal for a large number of sleepers. Latex is naturally noise-free, so there is little noise when you move throughout your sleep. 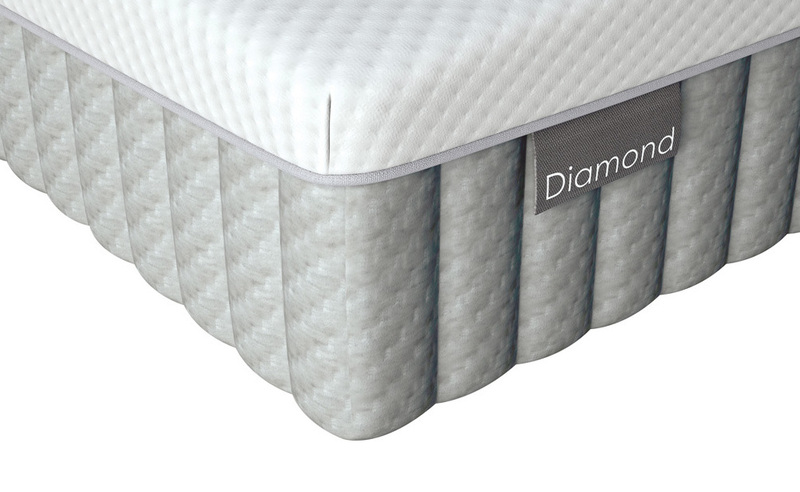 The Diamond mattress has a seven comfort zone construction which cushions the softer areas of your body such as the shoulders while being firmer in areas that need support such as your back to keep your spine aligned. As well as being hypoallergenic it also uses Actipro technology to prevent the formation of bad odours. To promote air flow the latex uses open cell technology which also gives added pressure relief. The mattress is also supplied with an 8-year guarantee and comes with free two person delivery. If you're suffering from back pain then when you sleep is the best time to recuperate, rest and heal your injury which is why your mattress is so important. Support is the most important attribute that will help treat this, and you need to ensure that If you suffer from back pain, you first visit a medical professional. You also need to choose a mattress that provides enough support to not only keep your spine aligned but also have enough comfort to relieve tension. If not treated then this can develop into more serious long term issues. Back pain is a problem that can severely affect our quality of life and the best time to treat this is when you’re sleeping so you need a surface that will accelerate the healing process and not make it worse. 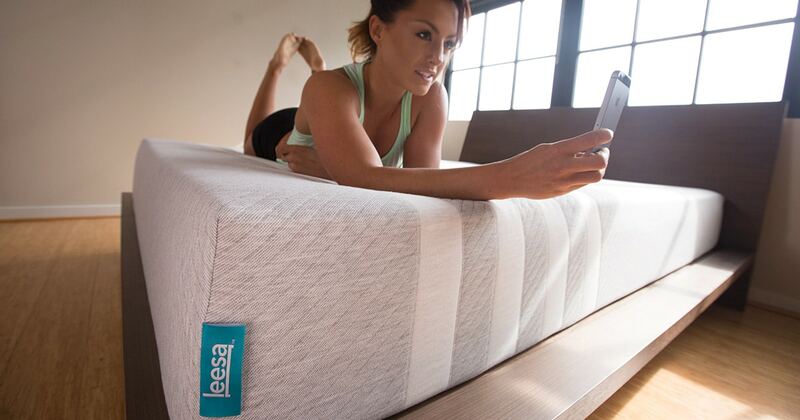 The Leesa mattress is your solution and uses memory foam to cradle and support your body without the suffocating sinking feeling that traditional memory foam commonly has. Because of the dense memory foam, this makes it suitable for all sleepers and also has a layer of cooling Avena foam to ensure that you remain cool throughout the night but also provides bounce and responsiveness. This responsive, supportive mattress is ideal for those with back pain as it keeps the spine aligned and cushioned which relieves tension leaving you feeling well rested when you wake, and you’ll see any existing pain begin to ease away. The mattress comes with a 100-night sleep trial which is more than enough time so you can see how effective it is at reducing back pain and soreness. Discover the full lowdown here. Heavier people will need to make additional considerations when choosing a mattress. Heavier people will place more pressure onto the mattress which means that it may begin to sag. To avoid this, you may need to purchase a mattress that is thicker and firmer so it can withstand the added pressure. A high-quality pocket sprung or hybrid mattress will have ample support while also keeping you cool and contoured to relieve pressure from your vulnerable body parts. Thicker and firmer mattresses will also have higher quality edge support. Ghostbed has designed a mattress that can maintain high levels of support and performance for heavier people. The mattress has an overall weight limit of 53 stones per person, and an extensive testing process has verified this. The mattress can withstand these high weight limits because it has a higher density base layer for extra support which makes the mattress 2.5 cm thicker than average mattresses. This layer also means that the mattress is suitable for sleepers of all positions. Having this level of added support will not only help to relieve pain and discomfort but also to prevent problems from developing. Heavier people can often overheat more than lighter people, so the mattress has open cell technology that allows air to flow in and out to regulate your temperature while you sleep. Ghostbed has given you the opportunity to test the mattress with a 101-night sleep trial and a 20-year warranty. We've created a full review here. Air mattresses are a quick way to create a comfortable sleeping surface which makes it great if you’re going camping or having guests over at the last minute. You wouldn’t want to sleep on it every night, but it’s better than sleeping on the floor or sofa. Air beds are simple to assemble and need a hand or electric pump which fills it with air until it reaches it’s fully inflated position. Air beds come in many different sizes and when it's not in use it can be deflated and stored away. Sofa Beds are ideal if you’re limited for space in your home and it allows you to convert your sofa into a sleeping surface. Essentially it means you can have two pieces of furniture in one and they’ve come a long way over the years and are now both stylish and functional. There are many high-quality manufacturers that produce and sell sofa beds so there is almost as much choice as there is for traditional sofas so you’ll be able to find one that fits into the current interior style of your home. Bed in a box mattress brands are a relatively new phenomenon that is shaking up the mattress industry. These brands are usually online only which means that they don’t have to account for overheads usually associated with physical storefront locations. As a result, they're able to sell high-quality mattresses at lower prices and these mattresses are then shipped directly to your door. The risk is reduced because most come with both a sleep trial and an extended warranty. Mattresses in a box enable you to be still able to afford a high-quality mattress without the traditional large outlay. The position that you sleep in is one of the most significant considerations you need to make when choosing the firmness and material of your new mattress. The main sleeping positions are front, back and side and we’ll show you the best mattresses for each one. Side sleeping is considered to be a healthy position to put the body in as long as your spine and back remain aligned and supported throughout the night. For this reason, it’s ideal that you choose a soft/medium firmness mattress to ensure that there's sufficient contouring to mould to the shape of your body. When you sleep on your side, there's a smaller area of your body that’s in contact with the mattress surface. If the mattress is too firm, then even less of your body will be in contact which will lead to less support and can result in shoulder or back pain. The Simba mattress has been designed using sleeping data from 10 million sleepers, so it’s been created to feel wonderful for side sleepers. The mattress is split into different layers which all have their benefits, but when they work together, this enhances your sleep by distributing your weight evenly across the surface. The Casper mattress is an award-winning mattress that's well established into the mattress market in a very short period. The mattress features zoned support which ensures that your shoulders and hips are aligned giving you greater comfort. The Eve Sleep mattress is a high-class mattress that will leave you feeling refreshed in the morning ready to attack the day. The mattress gently relieves your body of pressure while applying support where you need it most along the length of your body. Sleeping on your front is known to be one of the worst sleeping positions. But of course, once you’re used to sleeping in a particular position, it's hard to change it, so the best thing you can do is make sure you’re sleeping on the best mattress for the position. Support is the most important thing which is why a firmer mattress is most suitable because it keeps your spine aligned, while it’s also recommended to have a thinner pillow with a low loft, so your neck isn’t strained. Foam and hybrid mattresses are ideal for front sleepers as you get enough responsiveness combined with support. If you sleep on your front, then you need a mattress that works in your favour and keeps your spine aligned and straight to reduce the chance of pain developing. Simba has created a Hybrid mattress that contains a combination of materials to give you an unrivalled sleeping experience leaving you feeling refreshed when you wake up the following day. If you sleep on your stomach, then you’ll be best suited to a medium firmness mattress that will stop your back from arching, so you don’t feel stiffness when you wake the following morning. This medium firmness which provides enough bounce in the top layer, so you feel supported while also having open cell technology that supports airflow in and out of the material. The Emma mattress has been designed using data points from a range of different body types to create a mattress that is suitable for all sleeping positions, including stomach sleepers. This has led to a three-layered mattress that brings body support, pressure relief and coolness. Sleeping on your back is generally seen as a healthy position, and a medium/medium firm mattress rating is ideal. This will give you enough comfort and support to provide you with a top quality nights sleep. However, if you’re suffering from any pain, then you may need a firmer mattress rating as this will give you more support and less hug. Medium/Medium firm mattress rating is available in a number materials including memory foam, latex and hybrid so the one you choose will depend on your personal preferences. It’s incredibly important if you sleep on your back that you have a mattress that keeps your back aligned without sinking too far into the mattress. 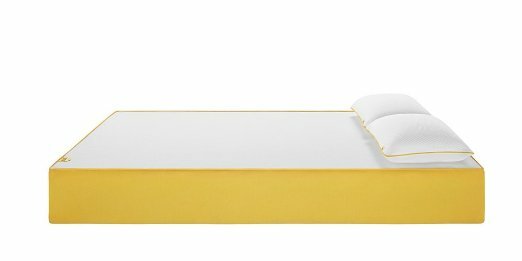 The Simba Sleep Hybrid mattress is a revolutionary mattress that has a unique combination of layers that provides support and comfort to your back allowing you to wake in the morning ache and pain-free. Back support is critical, so if you sleep on your back, you need a mattress that can meet these needs. The Casper mattress is an award-winning mattress that has been constructed with four separate layers to ensure that you maintain strong spine alignment every time you sleep. Leesa has simplified the mattress making process to create a premium memory foam mattress to give you great sleep night after night. This UK manufactured mattress features a three-layered system that gives your back the continuous support that it deserves. It’s rare that a person sleeps in the same position for the whole night consistently, but rather changes between positions as the night progresses and you probably don’t even realise it. If you’re one of these people, then you need to look for a mattress that has a universal firmness making it suitable for all types of sleepers. This will ensure that you remain supported and comfortable throughout the night even when you change positions. Although material and sleeping position is essential to consider, you may have some additional specific needs that will affect which mattress is best for you. Adjustable beds are not only more affordable, but they no longer look like they belong in a hospital as they now have modern designs and functionality. Adjustable beds allow you to adjust the angle of both your upper and lower body which makes it ideal if you suffer from conditions such as snoring or back pain. Adjustable beds are also useful for other activities aside from sleeping including reading and watch TV while keeping your spine naturally aligned to ease any existing pain or pressure. Adjustable beds used to be thought of as only being suitable for older people, but younger people can also benefit from their functionality to prevent joint problems from developing. If you share a bed with a partner, then this can create a challenge to get a surface that suits you both. You need to ensure that there is a low level of motion transfer which means that when one of you moves, the other person is less likely to feel the transfer of the movement. This will decrease the amount you’ll both be disturbed during the night. If you both prefer different firmness ratings, then you have two options. You either compromise which usually means getting a medium firmness mattress, or you can purchase a mattress that has split firmness, so you customise each half to your personal firmness preference. If you are a heavier person then to prevent any sagging from forming, it's recommended that you purchase a firmer mattress that will also give you greater levels of support. This will maintain spine alignment which is essential for a restful sleep, so you don’t wake up with joint pain in the morning. Firmer mattresses are better suited to back and stomach sleepers who need that added support when sleeping. Your body weight will determine the overall feel of the mattress that will be best for you. If you have higher body weight, then you will need a firmer mattress to support the added pressure. If you’re lighter, then a softer mattress will be more suitable, so you slightly sink into the mattress and benefit from the contouring features. If you sleep on your side, then a slightly softer mattress using a material like memory foam will give you a high-quality sleeping experience. If you occasionally suffer from neck pain, then this isn’t a massive issue, but if it’s a common problem then not only do you need to seek professional medical advice but also ensure that both your pillow and mattress are suitable for treating the problem and not causing the problem to worsen. To reduce the strain on your neck, a mattress needs to provide support to the spine and also if you’re a front sleeper, then your pillow needs a lower loft, so your neck isn’t strained to get into position. If one of these components is missing, then the condition may develop further. Snoring can not only negatively affect your sleep quality, but if you share a bed with a partner, then it can change them too. Snoring is caused by your airways being obstructed which means that air can’t pass as freely. To reduce snoring you need to elevate your head slightly and this can either be done using a thicker pillow with a higher loft or with an adjustable bed. Of course, an adjustable bed is a more significant investment, but it will give you an improved sleep as you can raise your head above the horizontal angle. Ideally, you’ll need good responsiveness and bounce while depending on your household you may want a mattress that is quiet and doesn’t make too much noise. Also, edge support is essential as this will affect how much support you get at the edge of the bed. Higher quality memory foams have this necessary bounce whereas poorer quality memory foam doesn’t. Also, Latex, pocket spring and hybrid also provide good performing options. For those that have a higher budget and want to invest more substantial amounts into your sleeping surface, luxury mattresses are the highest quality solutions on the market using premium materials. High-end models not only use better quality materials but this will lead to them lasting considerably longer before needing to be replaced, and also they will have more extended warranty periods which gives you more protection and ultimately greater peace of mind. What to Avoid When Looking For a New Mattress? We’ve taken you through the essential features that you want to see in the best mattress, but there are also many things that you need to avoid in any mattress that you buy. This will not only save you money in the long run but also prevent your body from developing aches and pains. If you buy a mattress that doesn’t have a trial period, then you’re stuck with that mattress regardless of whether it's right for you. This can be very costly if you decide it’s not right for you and then you're forced into buying another one. Testing a mattress in store for a few minutes is not a good indicator of if it’s going to be effective to sleep on every night for the next ten years. A trial gives you a period to test the bed in the comfort of your own home which allows you to make a more an informed decision. A mattress is a significant purchase for most people, so it’s essential to ensure that you’re protected. No matter how good the brand is, there’s always a chance that a fault could develop which is why a warranty is so important. They routinely last between 10-20 years. It also gives you the added peace of mind that if anything goes wrong, the brand will be there to help and don’t disappear once they’ve gotten your money. You should take the average review and not reviews that are at the extreme side of the scale; if a mattress has a significant proportion of negative reviews, then it's recommended to avoid purchasing it. Similarly, if you see reviews that mention a feature that doesn’t suit your sleeping style, then you should avoid, i.e. if the mattress lists strong edge support as a quality, but customer feedback says it has poor edge support. Even if you’ve determined that you prefer a softer or firmer mattress, try to refrain from getting a mattress that is incredibly soft or extremely firm as you’re much less likely to find comfort with these options. Mattresses that are too cheap lack the quality needed to provide a supportive and comfortable sleep, however, it may be suitable if the mattress won’t be used much for example if it’s going in a guest room. At the other end of the scale, if the mattress is too expensive, it may not bring any additional benefits that a lower priced mattress has. It’s well known that many brick and mortar brands purposely set their original prices extremely high and then offer discounts to make it seem like you’re getting a significant discount when they had no intention of ever selling at the RRP price. Mattresses generally need to be replaced every 7-10 years. There isn’t a reminder for this, but if the quality of your sleep has deteriorated, then it may be time to begin shopping for a new one. Even if you’ve reached the 5-6 year mark with your current mattress, you need to be aware of its condition so you can notice any changes that happen from month to month. An easy way to do this is to monitor how well you’re sleeping, i.e. if you’re waking up with achy joints or feeling groggy and irritated then it means that your mattress is not giving you enough support and your sinking into the surface. It means that the mattress is losing its original shape and needs replacing. Finding the bed uncomfortable compared to when you first purchased it. Motion isolation is deteriorating so you can feel your partner moving more and more. So now you can see that no best mattress is suited to everyone because everyone has a different set of preferences that need to be taken into account including sleeping position, budget and current medical conditions. We hope that this guide has shown you the best mattress for your needs.